3D TV or not 3D? 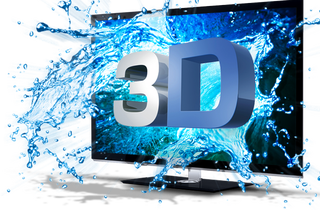 Much has been written about how 3D on TV stinks. I adhered to this mantra until it was time to buy. Now I’m worried about missing out on a feature I might actually enjoy. I have easy access to all the 3D movies I want if I want them, so content isn’t a problem. I have a kid who likes 3D films and a wife who hates them. So, the question is if it’s worth it. CNET recently wrote an article on how passive 3D would finally be the best choice for 3D viewing with the coming of 4K sets. Because there is twice the vertical resolution of 1080p, placing each channel on every other line shouldn’t produce the scan line effect it used to or the misalignment problems of active 3D systems. The problem is there are really only two passive 3D 4K screens, one by LG and another by Sony. Both are overall considered to be crap. So I’m now left with a dilemma: 3D or not 3D. On one side I can get the highly rated and super cheap Vizio M-Series with no 3D, or a Samsung display with Active 3D for $500-$600 more. I’d love to check out active 3D to see what it’s actually like, but there’s no place demoing it. My question is, is 3D worth it or is it total garbage that I will regret spending extra on?